After a long and storied career in public service, Alan Jepson today passed away. 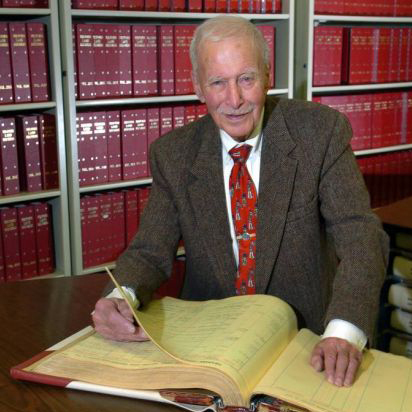 Jepson, former Mayor of Milford and City Clerk, was a titan in the Milford Democratic Party and faithful public servant to the community of Milford, Connecticut. His presence and guidance will be greatly missed. Coined as “Mr. Milford” Jepson served as Mayor of Milford from 1963 to 1969 and was the City Clerk for 22 years, from 1987 to 2009. He was known for surpassing party lines and worked with people from both political parties. During his remaining days as City Clerk he was covered by the Connecticut Post in 2009. A war veteran, Jepson last October was presented a Connecticut Veterans Hall of Fame induction certificate; he served in the United States Navy during World War II. Before he retired from the City Clerk’s office, his re-election campaign was covered back in 2007. Wednesday July 28th Update – Calling hours are Monday, August 3rd from 2pm to 7pm at the Smith Funeral Home, 135 N. Broad St. Milford. A funeral service will be held at St. Peter’s Church, 71 River St., Milford on Tuesday, August 4th at 10:30am. Meet directly at the church. Interment will be private. In lieu of flowers, donations may be made in his name to St. Peter’s Church or the Milford Library, 57 New Haven Ave, Milford, CT 06460. To leave condolences or for directions, please visit here. This entry was posted in News and Events and tagged Alan Jepson, Connecticut., Milford. Bookmark the permalink.